Daddy Rolled a 1: Game World Inspirations Friday: DL5 "Dragons of Mystery"
Game World Inspirations Friday: DL5 "Dragons of Mystery"
My allergies are not bothering me quite as much today, so here's the post I intended for yesterday. Based on the number of views I received to last Friday's post on how the "World of Greyhawk" inspired my own campaign setting, combined with the views and comments on previous posts on D&D's "Known World," the "World of Conan," and real-world Earth History, I've decided to dedicate Fridays to cover some of the sources of inspiration for my long-running campaign world, the World of Samoth. After the sources named above, a rather unlikely source emerged in the form of a small module that was technically part of the Dragonlance series. 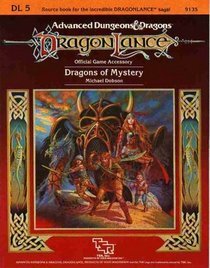 It's DL5: Dragons of Mystery, and it was published in 1984 by TSR, shortly after the first Dragonlance module series came to an end. I had read some of the Dragonlance short stories that had appeared in Dragon magazine around issue #84 or thereabouts, and had somehow acquired the first four Dragonlance modules, DL1-DL4, which basically replicate the action of the novel series The Dragonlance Chronicles. I had briefly flipped through the modules, and I vaguely remember my friends and I going through part of the first module before giving up. The game play just wasn't as fun as some of the other modules and home-made adventures we were playing at the time. However, the world of Dragonlance was really interesting to me. Lots of the concepts were very post-apocalyptic in nature, and things like the disappearance and then rediscovery of the gods, how steel was more valuable than gold, and the various "alignments" of magic were quite new to RPGs back then, and particularly intrigued me. Even though I didn't want to play the modules any longer, I knew that I wanted to try to borrow and expand on some of the concepts of the world to include in my own world-building efforts. Around this time, I was over at a friend's house and he had a copy of DL5. I flipped through it briefly at his house, and asked if I could borrow it for awhile. He tried to talk me out of it, saying that it wasn't an actual module but instead just "notes about the world and stuff. It's boring." That was actually the exact reason I wanted to borrow it from him, and he eventually agreed, and later on said that I didn't have to give it back because he didn't really want it. I still have it, and pulled it out of my collection to look through to write this post. DL5 is really a grab-bag of a lot of stuff, and lots of it wasn't really useful to me. Firstly, I'll get the stuff out of the way that was of no interest to me, but which I think is interesting to look at from a historical perspective. There's a 32-page booklet, and out of that, the stuff that I didn't really have much use for included the section on "Dungeonmastering the Dragonlance Saga." This is where you'll find the now-infamous section entitled "Obscure Death and How to Live With It." This 1/2-page section mentions that Dragonlance is a story, and certain "name" heroes and villains "are important and should not die until the right point in the story (sometimes, they should die at all!)." It then goes on to detail the concept of "obscure death" - basically, as a Dungeon Master, you are expected to cheat if a "name" hero dies, by such clever conventions of being comatose (the character was only thought to be dead! ), miraculous escape (if the character fell off a cliff, it turns out there was a ledge right below, just out of sight, that caught him), or saved by another (essentially, deus ex machina). Villains are allowed to cheat death by having a "special defense" unbeknownst to anybody else, having been someone else (it wasn't really the villain but someone dressed like him! ), resurrection, a "secret escape route," or using magic to "feign death." Not much else to say about this. Either you like playing "games" that way (in which case I'd say you're not really playing a game but instead just acting out a script pre-written by the DM, and should then really just have the DM tell you how everything is supposed to end so you can save your time), or you don't. I don't really begrudge people for liking one or the other, but you can guess where I fall in that dichotomy. Other bits in the booklet for which I didn't find a ton of use included errata from the first four modules, "how the heroes met" (a narrative on how the different "name" heroes all came to work together), and then 12 pages of character sheets for twelve different characters that you are supposed to play in the adventures (because, as as the booklet notes, they "don't recommend" making your own characters, because you'd need to alter your character concept to "fit" into the world). Now that we've got that stuff out of the way, let's cover the stuff that I really liked as a kid. Firstly, the inside cover of the module was a map of the constellations of the world of Krynn (the name of the Dragonlance world). I can't quite explain why, but I really dug this as a kid. Having a map of the constellations just seemed so cool and helped to make the world seem a little more "real" while at the same time keeping it fantastical with the inclusion of the three moons that controlled good, neutral, and evil magic and the different creatures and objects that made up the constellations. This, combined with the list of planets that was mentioned in the World of Greyhawk boxed set really got me interested in the astronomical and astrological implications of my own world, and which I spent a lot of time developing before finally just quitting because, as I mentioned in the Greyhawk post, it never saw any use during game play. There was also a "Creation of the World" myth that I really liked a lot - I hadn't seen one of these in a game product before, and hadn't read Tolkein's Silmarillion at this point, so aside from classical mythology, which was the first time I'd encountered the idea of having a creation myth for how the world came together, and I really liked that idea. I wrote several for my World of Samoth, each one told from the different perspective of the major races of the world. This also had an affect on my astrological stuff I'd been working on, as the constellations "changed" depending on which race of creatures you were dealing with. It all got a little complicated. The booklet also details all of the gods of Krynn, covering their "other names" (a little touch that I really liked, as it again spoke back to the fact that different cultures would worship the gods differently), their symbol, colors, spheres of influences, etc. This wasn't anything that hadn't been done in the World of Greyhawk, but for some reason, the gods of Kyrnn resonated with me more. I felt like I had a better understanding of who they were and how they related to each other and to the world than I did with the Greyhawkian gods. I still kind of feel that way today. There were two maps in the booklet: one of the entire world, one large color-map of the continent of Ansalon, which is where the main action from the Dragonlance Chronicles took place. The other was a huge two-color (brown and blue) map of the Dwarven Kingdom of Thordardin, which was pretty cool, but I personally liked the continent map better. It was more to my interests then of how to develop my own campaign world and create its accompanying map. 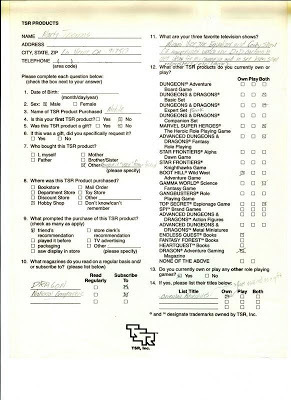 One thing I noticed while just looking through the booklet, is that the last page is identified in the Table of Contents as "Questionnaire: In which our Marketing Department desires to know your feelings and desires, and the fate of the world of Krynn lies in your hands." (The entire table of contents uses this kind of flowery, faux-Gygaxian language). 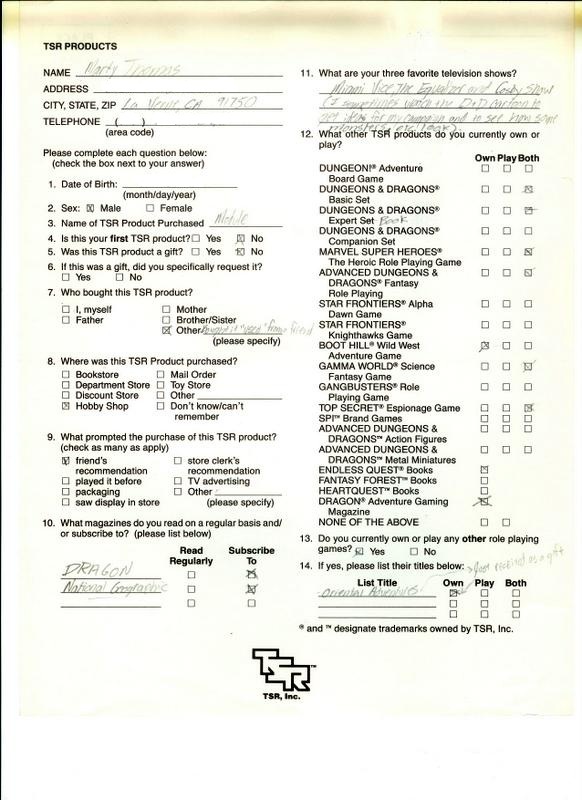 I didn't actually fill the questionnaire out, but I have a copy of another TSR marketing survey from another product that I did fill out (but never mailed) that was stuck into the back of this booklet. I'm not sure which product it came from, but I included a copy of it here just for giggles. I blurred out my address and phone number (at the time), as well as my birthday. It's really funny to read what my "favorite" programs were at the time. I think I mainly wrote those to try to be cool, because while I did watch all of those shows, I'm not sure they were my "favorites," particularly "Miami Vice." So, that's a look at DL5: Dragons of Mystery, and how I took some inspiration from it to help develop my own world. Any of you have this one, and if so, how did you "use" it - as intended, as a way to complement your Dragonlance games, or did you use it like me and just pick-and-choose the parts you found interesting to "kit-bash" into your own games? 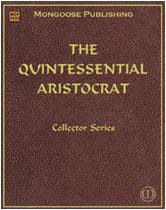 Where to Buy: It doesn't look like this is available as a PDF yet on dndclassics.com, but there are several people selling used hard-copies on Amazon.com. More Information: There are tons of fan sites, but here's the entry on Wikipedia.